If you follow StylishTwo at all, you have probably noticed that we like to travel, frequently together. You may have also noticed that last week both Em and I had our flights from Costa Rica back to the USA canceled due to a severe snow storm that hit the eastern side of the country. Em was able to make arrangements to fly into Canada and then back home from there, but I was to (not so heartbreakingly) remain to Costa Rica for two extra days before I could make my way home. So how exactly can you handle this situation with style and grace? You have probably noticed recently, if you follow our blog, twitter, Instagram, and Pinterest that Sarah and I have been jet-setting this spring!Sarah has been in New Orleans, The Dominican Republic, and recently Nashville. While Em has been in The Dominican Republic, Florida, currently in Pennsylvania and headed to Texas on Monday. So what tips and tricks have we learned about flying that makes us A+ airport patrons? 1. Choose an airline that you can check baggage for free. We fly Southwest and JetBlue from Portland whenever we can! Southwest allows you to check 2 bags free while JetBlue allows you to check your first bag free! Looking like a celebrity while walking through the airport is difficult when you are juggling your oversized bag and a rolling suitcase. Not to mention finding a place for it to rest in the overhead bins is a challenge. Having to locate a place for your luggage in the overhead compartment is one of the reasons it takes forever to load the plane. So instead, choose to fly an airline that allows you to check a bag for free and glide easily onto and off of the plane. This trip it only took 10 minutes for the luggage to come out on the carousel which gave me plenty of time to get off the plane, stop at the restroom and make it to baggage claim to pick up my luggage and walk out the doors to my waiting ride. 2. Gate check your luggage. When you’re flying a larger airline like United or US Airways you often can gate check your luggage for free to your final destination. The last two US Airways flights I came prepared. My laptop bag was in my rolling suitcase, but I knew that they would ask people to gate check their luggage because the flight was full. So I pulled out my laptop bag and was able to gate check my luggage to my final destination without having to pay the $25 or $40 baggage fees. Then it didn’t matter when I boarded the plane because all I needed was to sit in my seat. So I didn’t stand around anxiously waiting to get on the plane to make sure there was going to be room for my rolling suitcase. 3. When traveling alone, always sit in the aisle. This is a rule that I always follow which drives my husband crazy. When we fly together I always sit by the window, but when I fly alone for business I always sit in the aisle. The ability to get up if you need to use the restroom is so convenient. Who hasn’t been on a flight where you need to get up but the person at the end of the row (likely traveling by themselves and working on their laptop) looks too busy and you don’t want to bother them to get up. The other benefit of flying the aisle seat is your ability to stand up and walk right off the plane. Depending on how long you’ve been flying for, you’re ready to stand up and get off the plane. Not having luggage in the overhead compartment makes deplaning quick and easy. 4. Pack strategically for security. I pack all my toiletries in one bag and I pack that in the front pocket of my suitcase so that I don’t have to dig around to find it. 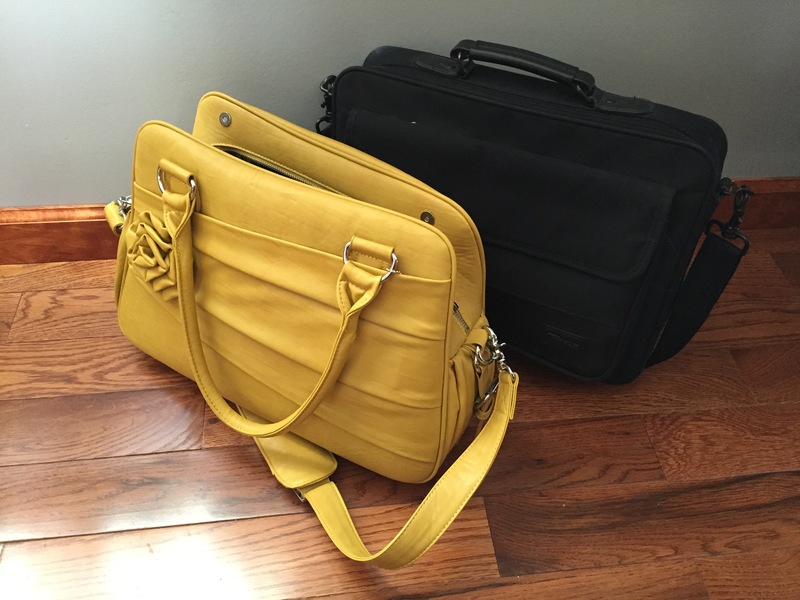 I also pack my laptop on the top so that it’s easy to slip out of my laptop bag and into a separate bin. I can have all of my items out of their bags and onto the conveyor belt in seconds. Know what you need to do for security and be prepared. I always print mobile boarding passes when possible so I slip my phone and license back into my purse, kick off my slip on shoes, pull out my laptop and toiletries and go. I don’t wear a belt, I don’t have anything in my pockets, I don’t have toiletries in multiple bags. I don’t have my laptop bag packed in another bag and I’ve already taken off whatever coat or sweater I am wearing. 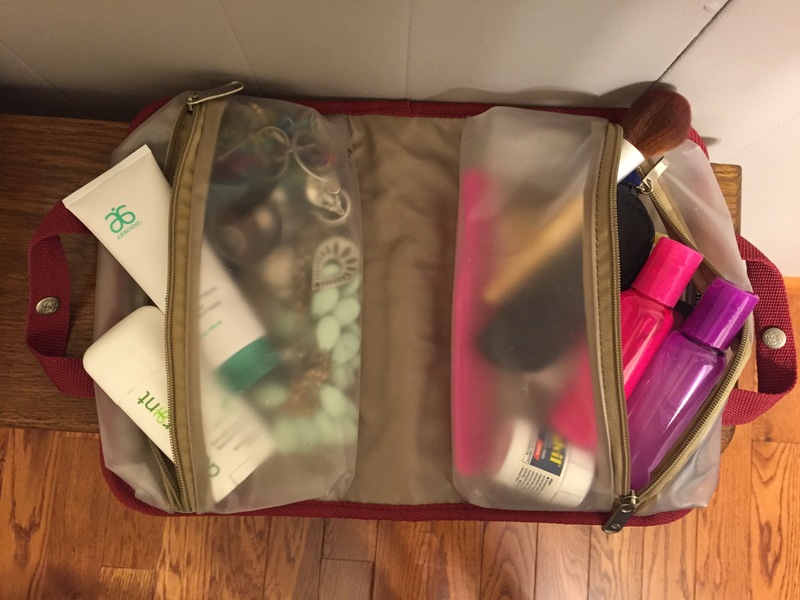 Pack all of your toiletries in one easy to access bag! 5. Wear something stylish. Airport style is talked about in so many magazines and fashion blogs. I always wear layers. It’s cold outside, it’s hot on the airplane, then you take off and it’s cold again. So wear thin layers that you can take on and off to accommodate the varying temperatures that you find while flying. And beauties like these earrings below don’t set off the detector. I always wear my jewelry through. Even if it shows up on the scan they can quickly identify what it is. And I got several compliments on my earrings at the airport which makes you feel good about yourself! Confidence really shines through, so dress up your airport style with accessories. A great bag, fantastic shoes, and beautiful earrings. 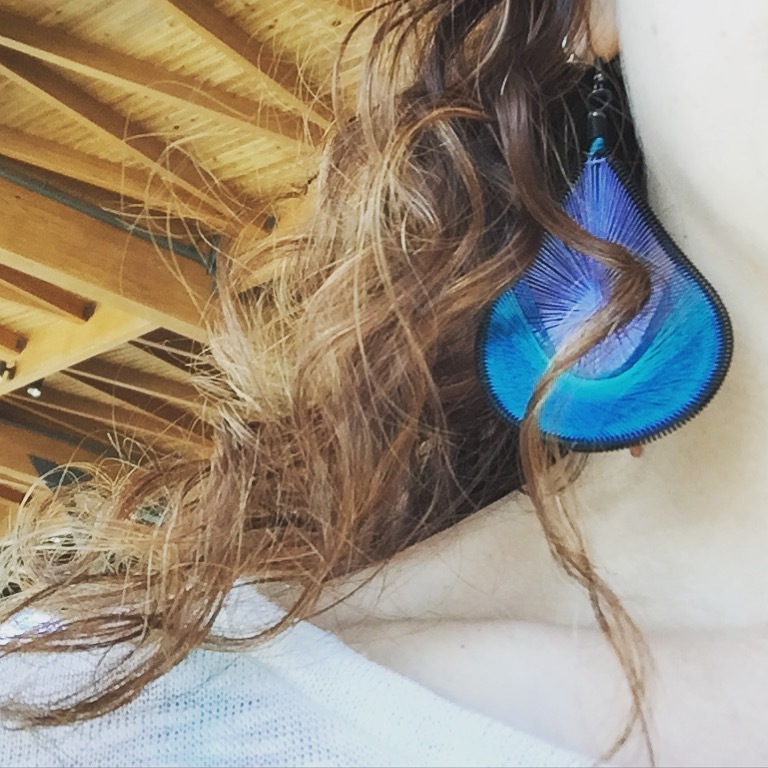 Wear a great pair of earrings to make you feel more stylish while flying! 6. Take the first flight in the AM. If you are at all worried about getting to your destination, take the first flight you can in the morning. A pilot friend of my always recommends this. Hang ups at airports can have your flight delayed, and if you’re from Maine, you know it’s sometimes hard to get home. So taking that early flight helps to ensure you make it to your destination. Your plane is already at the airport, so you’re not waiting for it to arrive from another airport which can cause delays. You have all day to get where you are going, and you have the possibility to hop another flight if something happens. 7. 45 Minutes is all you need. Sure, be over cautious. Arrive at the airport an hour and a half early and bring work or a book. But for me, if i’m not checking any baggage and i’m flying within the US I never arrive more then an hour or 45 minutes before my flight. Security in Portland is a breeze and there are only 10-12 gates. I hate to sit around waiting to get on my plane. So I typically breeze through security, through the airport, and shortly after, right onto my flight. Now, when you are traveling with a group, this is not an option. Group travel always slows things down. 8. Don’t expect them to hold your plane. Although I just told you above that you don’t need all that extra time, especially if you’re not checking baggage, I don’t want you to confuse that with thinking they will hold your plane. They will NOT, so don’t be late. Don’t be fooled by thinking they will wait for you. I’ve had my baggage held up in the DR and missed my flight. I have had weather delays that left me in Charlotte, and I’ve had flights cancelled with no recourse to get me to my final destination. FAA regulations are strict. They will shut down towers, they will send flight crews out because there are only 8 hours between their flights, and they close those doors 10 minutes before take off no matter what. I hope this never happens to you, but if it does I caution you: Do not let them send you to another airport without confirmation to your final destination. Don’t let them send you to Boston if you’re final destination is Portland – because they won’t help you get home from there if they change your destination. Don’t let them send you to another airport with an overnight stay without writing down the gate agents name and which airline they work for. I say this because US Airways and American Airlines are now the same company, but they do not cross read systems. That little gem left me in negotiations with the gate agent in Miami for 3 hours before they figured it out. So know your rights as a passenger and be cautious of what you agree to. And a bonus, personal preference tip: Always wear easy to slip on and off shoes with socks! I never go to the airport without socks because you’ll have to take your shoes off, just like everyone else. 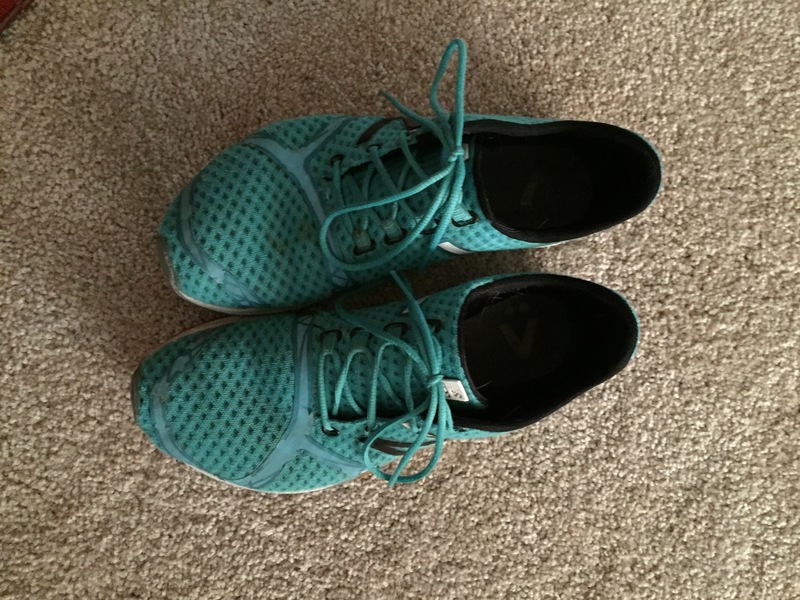 It takes me back to my locker room days or college where you always wore flip flops in the dorm showers – in my opinion – it’s just a great practice to wear shoes that I can wear socks with. But I don’t like to be boring so a great pair of Tom’s or my a pop of color like my sneakers below. lightweight and flexible they make for perfect airport shoes! It’s always about the shoes! Lightweight and flexible make them perfect for the airport!